Oh, there’s still a Game 4 on Friday night. But for all intents and purposes, these NBA Finals are done. If the Cleveland Cavaliers can’t beat the Golden State Warriors on a night when LeBron James finally got some help and Klay Thompson and Stephen Curry were basically non-existent, they have little hope of winning a game, let alone four in a row for what would be the most epic of all comebacks. While Golden State starts planning its parade – is planning really needed when you’re doing it for the third time in four years? – Cleveland needs to think of what changes it will make to entice free-agent-to-be James to stay. Because this team won’t cut it. “That margin for error is so thin and so little against them that, in some cases, you almost have to be perfect,” Kevin Love said after the Warriors took a 3-0 lead with a 110-102 victory Wednesday night. Despite zero points from Kyle Korver and a marginal game by Tristan Thompson, this game should have been Cleveland’s for the taking. It was playing in the friendly confines of Quicken Loans Arena, where the Cavaliers were 8-1 in the playoffs. The crowd was raucous even before the opening tip, and you’d have to be comatose not to feed off that energy. The Cavaliers got the start they wanted, racing out to a 12-point lead midway through the first quarter. The physicality that Tyronn Lue had preached the last two days was on display, while J.R. Smith and Love finally gave James some help. The Warriors, meanwhile, got almost nothing from Curry and Thompson. Curry needed a pair of free throws in the closing seconds just to reach double figures, and he finished with 11 points. Thompson wasn’t much better, with 10 points. The Splash Brothers were a combined 7-of-27, including 3-of-15 from 3-point range. “Holding Steph to 11 points and Klay to 10, you would think you would win that game,” Lue said. As much as people gripe about a fourth year of Warriors-Cavs, how it’s the same ol’, same ol’, it’s not even close. 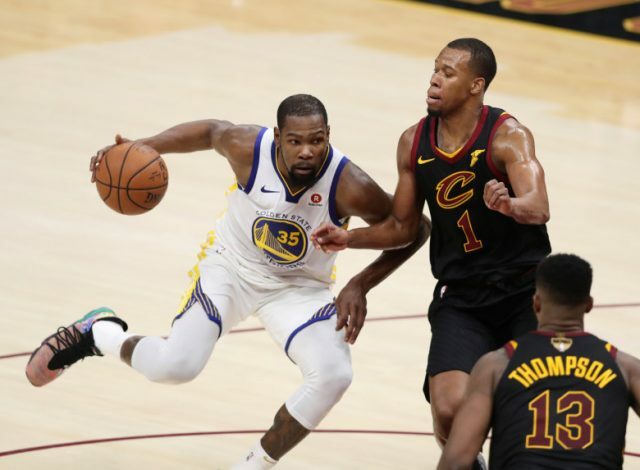 Golden State bears little resemblance to the team that needed six games to beat Cleveland in 2015 and blew a 3-1 lead the next season, and the difference is Kevin Durant. Curry, Thompson and Draymond Green are spectacular talents, no question. But Durant is, as James said Wednesday night, “an assassin,” and he single-handedly pushed the Cavs to the brink of elimination. Just as he did in Game 3 last year. Durant finished with 43 points, including a pair of 3-pointers that might as well have been daggers. After trailing by as much as 12 in the first half, the Warriors went into halftime down just six after Durant hit a trey practically from mid-court. With less than 50 seconds to play and Golden State clinging to a three-point lead, Durant let fly with one last one from long range to put the game out of reach. “Durant got away from us a little bit,” Lue said in what qualifies as the understatement of the night. There was a time when the Warriors seemed vulnerable. They needed seven games to beat Houston in the Western Conference finals, and a stunning lack of focus by Smith to win Game 1 of the Finals. But championship teams, James said, rise to the occasion. And James can’t beat the Warriors himself. After big first halves, Love and Smith cooled off. Love had only five of his 20 points in the second half, while Smith scored three of his 13. Rodney Hood had a monster night, finishing with 15 points on 7 of 11 shooting. But it’s clear the Cavaliers need more. It’s an admirable attitude. But even if the Cavaliers can do a better job of containing Durant, odds are that Curry and Thompson will not forget how to shoot for a second night in a row. No, this was the game the Cavaliers had to win. Should have won. Now the result of these Finals is inevitable, and it can only be delayed for so long. Next articleNightengale: MLB Renders Verdict on Heimlich, but is it a Life Sentence?